Most of the everyday problems that people experience can be traced back to stress that is locked deep within the body, aura, and mind. The storage of stress can be in muscles, cells, aura, chakras, blood, DNA, neural pathways, the heart and organs, etc., which may manifest in adverse physical, emotional and mental reactions. Neuroenergetic Kinesiology is a well recognized, comprehensive, non-invasive system of healthcare that uses calming and muscle monitoring techniques to unlock and access the body’s information on stress and symptoms in order to identify and release the stresses that can cause disease, physical dysfunction, emotional trauma and the like. Kinesiology is about enabling an individual to access the information contained within the body and using that information to correct any imbalances by enabling the body and mind to re-integrate and heal itself from within. In effect, the stress that was blocking the body from changing or moving forward is now transforming to support change and heal. Energetic Kinesiology treatment is covered by most private insurance companies. What Can Kinesiology Do For Me? Access consciousness: the thoughts stress, and locked-up energy in your mind and body. They relate to all areas of your life such as creativity, awareness, body, sexuality, joy, sadness, money, control, and many more. When you receive a Bars session, it allows the charge in these areas to dissipate, together with the stress and worry, giving you the choice to be more generative and have something different show up in your life. With ease! Use it on everything! How Does A Bars Session Work? For the entire process you will be lying down, face up and fully clothed. To initiate the process, the practitioner will start pulling energy through your body. From then on, the whole session will be focussed on your head with the practitioner lightly touching various points. The whole session will typically last 60 - 90 minutes. During the session you are free to do as you please; you can talk to the practitioner or just float off in a world of your own. After the session, at worst you'll feel like you've had a great massage, and at best, your whole life could improve - how does it get any better than that? Christina Yu - "My sleep quality has improved and I no longer have migraines"
"I've been seeing Gosia for a few months for energetic kinesiology and she's truly amazing. When I started seeing Gosia, I was dealing with years of depression, lack of energy on a daily basis, chronic migraines, digestive problems. During our sessions we worked on aligning my chakras and my aura. I've come away from our sessions always feeling better - my sleep quality has improved and I no longer have migraines. Stress has also been easier to handle on a daily basis and I've found myself with more energy to help me get through the day. She's gentle, reassuring and patient. She puts her patients at ease and I would recommend anyone that has a hard time handling stress from all wakes of life, whether it's a deeper source of stress of something as simple as work stress. Healing through energetic kinesiology with Gosia, there is a new sense of peace and resiliency that is hard to miss." Ela Mokrzyn - "Although a bit sceptical at first, I was amazed." "Thank you for introducing me to kinesiology. I very much enjoyed the sessions with you and I have learned a lot. Although a bit sceptical at first, I was amazed how receptive my body was and how I really did feel the energy flow!" Monica Carruthers - "I cannot recommend Gosia enough." "I cannot recommend Gosia enough. After having kids my anxiety over flying went thro the roff. I would have weeks of sleepless nights in a leading up to flight and there was nothing that helped me calm my nerves. That was until I went to see Gosia and only after one session I could see amazing improvement. I took 6 flights since I had my sessions with Gosia and I had hardly any anxiety over them and I sleep like a baby in the leading up to them. I wish I would seek Gosia's help sooner." 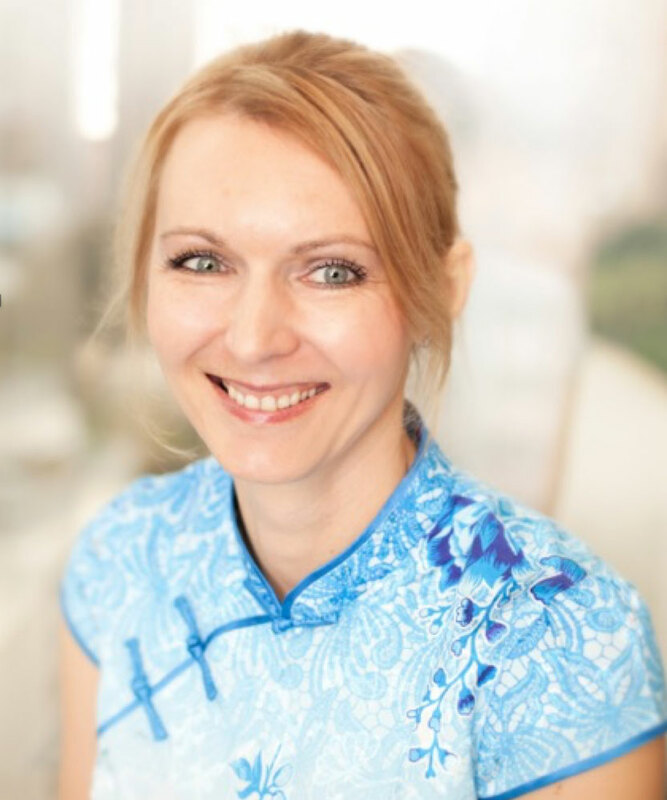 Justyna Hackmann - "Gosia’s knowledge about her subject matter is excellent"
"I have used Gosia for both Reiki and Kinesiology and have found these sessions extremely beneficial, both in terms of general well being and in addressing some long term health issues that I have had. Gosia’s knowledge about her subject matter is excellent, as is the advice that she has given to me. I would thoroughly recommend using Gosia."